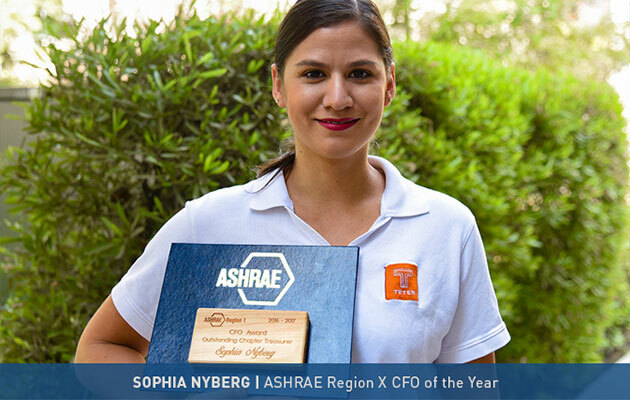 ASHRAE (American Society of Heating, Refrigerating and Air-Conditioning Engineers) has recognized Sophia Nyberg, TETER Mechanical Engineer-In-Training, as “CFO of the Year” at their annual conference. Annie Foster Courtney, Treasurer of ASHRAE Region X, spoke of Sophia’s outstanding financial management of the local ASHRAE chapter and going “above and beyond” her position as Treasurer. Thanks to her unrelenting commitment, Ms. Nyberg has improved the local ASHRAE Chapter’s financial standing and helped them achieve solid financial solvency.